If you can meet my two predicates of trustworthiness and speed, go for it! The physical boundary, and the layer just in front of that boundary that requires human interaction to fiddle with the results. 引用 DHH 的 Slow database test fallacy 的內容：The classical definition of a unit test in TDD lore is one that doesn't touch the database. What I saw was a tightly interwoven mass of rails and business logic being teased apart by a master of his craft. The result was, frankly, beautiful. "...you're not done until you also have tests for a piece of functionality -- I'm completely on board with that." Structured programming clarifies control flow; isolated tests clarify coupling. Compared to having an effective QA then no-QA is worse, but no-QA is better than the old dysfunctional relationship. As soon as you think you don't make mistakes any more, that's a mistake, and you stop growing. "you don't have enough tests (or good enough tests) if you can't confidently change the code,"
"the sign of too much is whenever you change the code you think you expend more effort changing the tests than changing the code." would you rather throw away the code and keep the tests or vice-versa? In different situations you'd answer that question differently. Only useful in the largely imaginary sweetspot of writing tests with non-technical stakeholders. What is an example of an Open Source Project which has "test-induced design damage"? What is an example of a project which does "TDD right"? 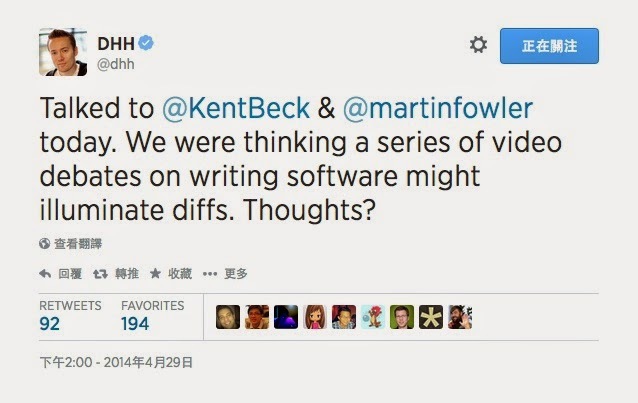 What could change about the way we write software to make TDD redundant or obsolete for Kent and Martin? 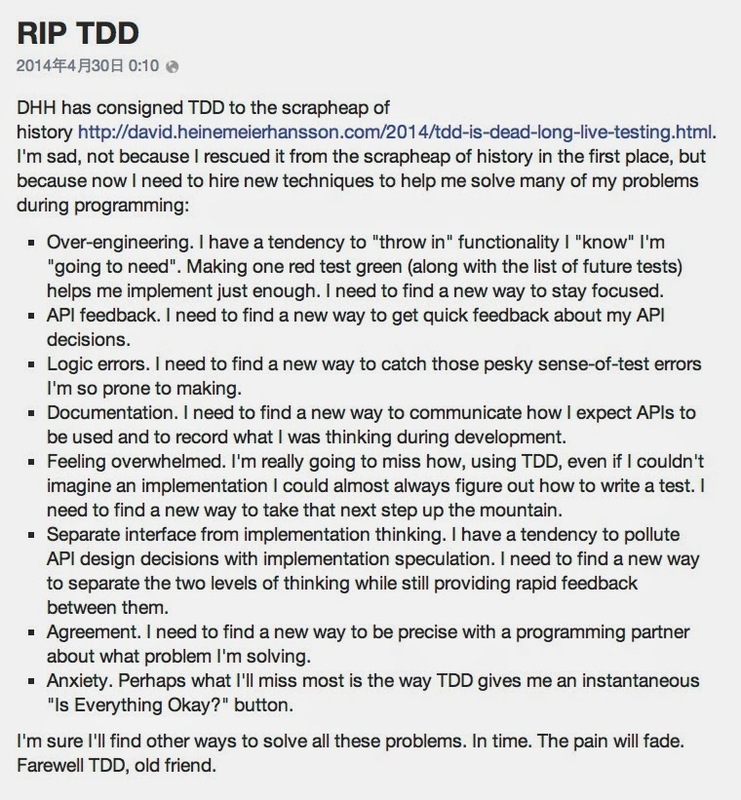 What could change about the way that TDD is performed to make it useful or beneficial for David? MF 回答："Some contexts are very suitable for TDD, some contexts less so". And people bring their personality into that context. How do you think a lack of (design) experience affects TDD and how do you think TDD affects an inexperienced developer? it does seem to be advantageous, and creates a self-testing code base which is easier to improve later through refactoring. So tdd gives you a good start point. 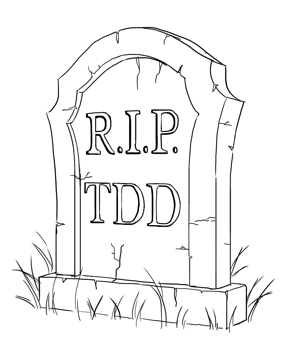 TDD isn't dead, but is glad David set fire to it so it could come out like a phoenix. We're not in a codified science, so we have to work with our own experience. "Code for tomorrow, design for today." Here's what happens in practice. "What if I do a paper design for a week, then test-drive the code? Is that TDD?" Sure, it's TDD.